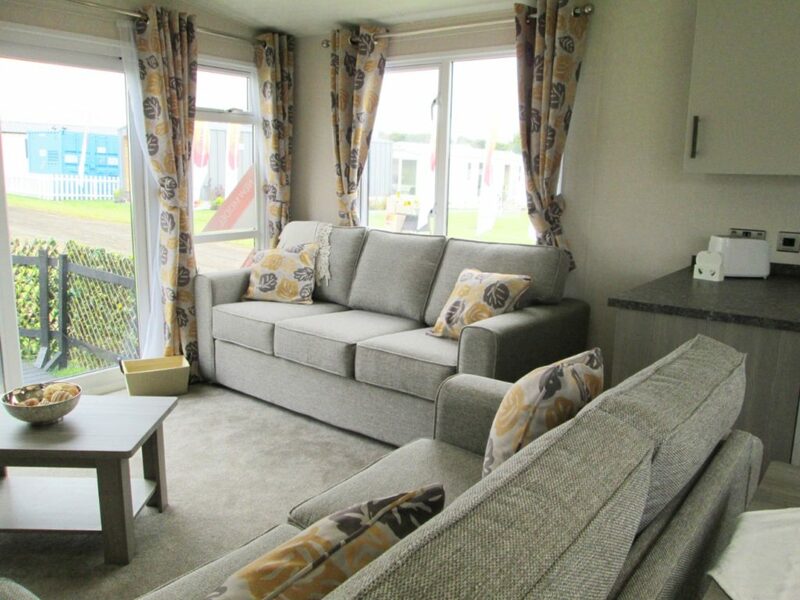 A roomy and relaxing holiday home in the mid price bracket. 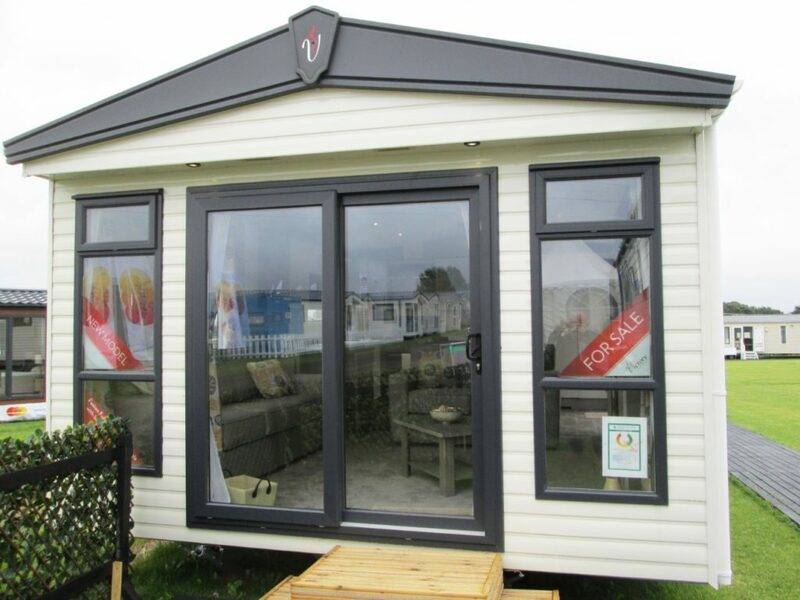 The Millfield static caravan from Victory Leisure Homes is a mid-priced home available in two sizes: the 38ft x 12ft 6in two-bed and a slightly longer 39ft x 12ft 6in three-bed model. Here, we take a look at the two-bed, complete with patio door. Outside, it has a black steel pantiled tiled roof with aluminium cladding in a pleasing off white. Canexel cladding in a various colours can be specified as an optional extra as well as the usual option of environmental exterior in green with colour co-ordinated windows and door frames. 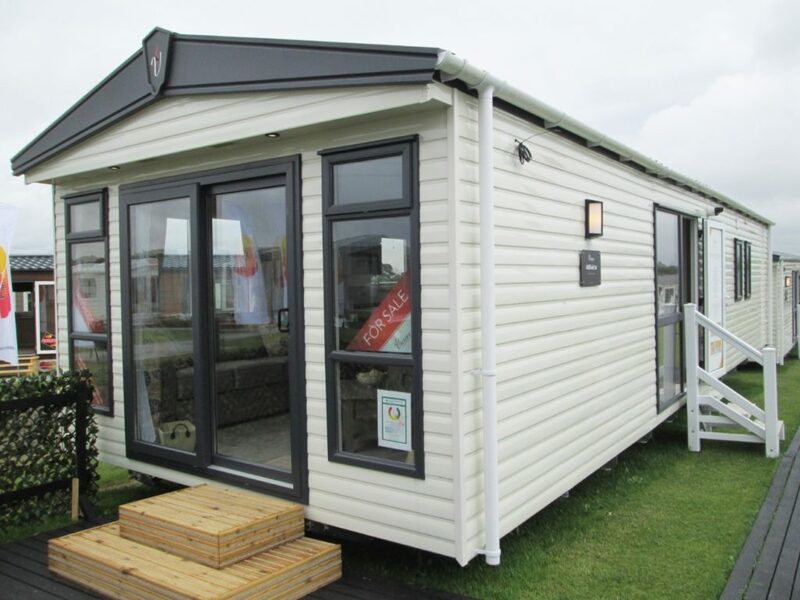 The usual arrangement of uPVC rainfall downpipes and guttering are also fitted and all windows and doors are in uPVC and are double-glazed but you do have the option of Anthracite coloured uPVC double glazing with Low-E glass which might be a good idea if you were intending on using the holiday caravan all year round. The unit sits on a painted steel chassis but a special fully galvanised ‘Fusion’ steel chassis is available which would be recommended in estuary/coastal areas with a high salinity. External walls are insulated to a depth of 50mm and all exposed pipework is lagged against frost damage. There’s also a ‘Winter Pack’ with beefed up floor and roof insulation package as standard. 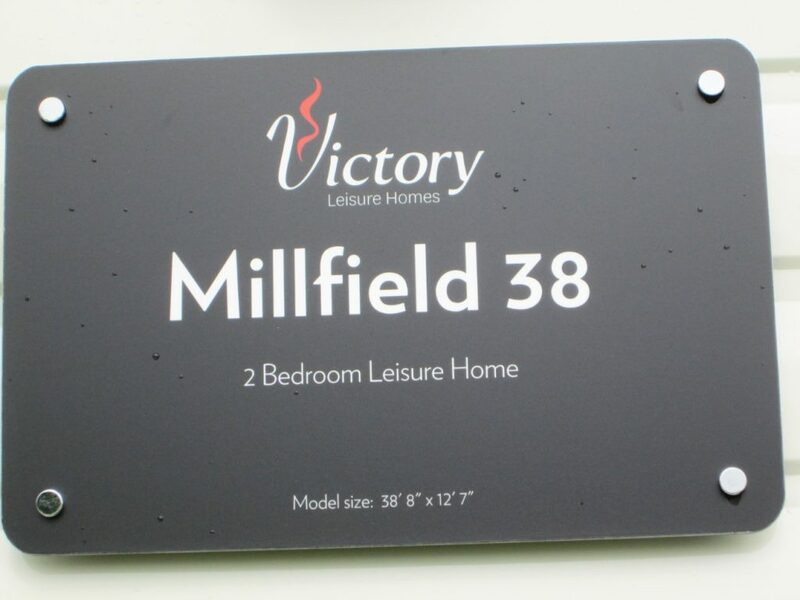 The Millfield is built to EN 1647 (non residential) standards. The front of the Millfield is features two very large panel windows plus a sliding patio door in the centre, all of which would allow plenty of light to flood inside the home as well as accentuating any views. Entering through the side access door, you immediately step into the open-plan lounge and kitchen area. Those big floor to ceiling windows and patio doors really do make this space bright and airy. First impressions are of a muted colour scheme of pale greys in the carpet and furniture with accent colours of yellow gold in curtains and scatter cushions. The high, vaulted ceiling adds to the impression of spaciousness and features LED downlights with low energy lamps. Furniture supplied includes two sofas – one three and one two-seater, plus a free-standing coffee table. 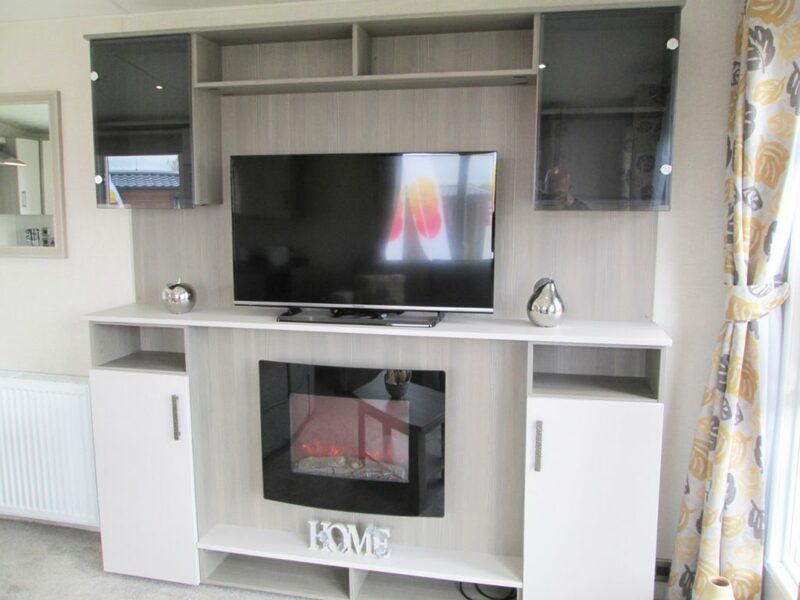 Along one wall is a large unit which contains a flat, electric, flame-effect fire, above which is a space to mount a flat panel television. These are surrounded by a combination of open shelving and cabinets with smart smoked glass and wood veneer doors. Other accessories in the lounge are a wall mirror, USB charging points and TV point. In one corner is a dividing unit which forms part of the kitchen. On the lounge side of this are a set of open shelves and a cupboard. The kitchen is laid out in a classic ‘C’ shape. There’s an array of cabinets on the floor and wall and Victory has used all the available space to create as much storage for kitchen equipment as possible. Cabinet doors are in an off white colour with work surfaces in a dark marble effect. Our review model had an integrated microwave and dishwasher fitted, although these are optional extras to the basic specification. You get a simple stainless steel sink/drainer with monobloc mixer tap and a free-standing gas cooker with four burner hob, oven and grill above, which is a sleek, illuminated hood and extractor fan. A glass splashback is fitted behind the hob. To the right of the door to the bedrooms is a tall cabinet containing the fridge/freezer (again an optional extra) and a separate cupboard housing the gas boiler. The basic Millfield has a free-standing under-the-counter fridge as standard. The kitchen area also contains a free-standing dining table and four chairs. 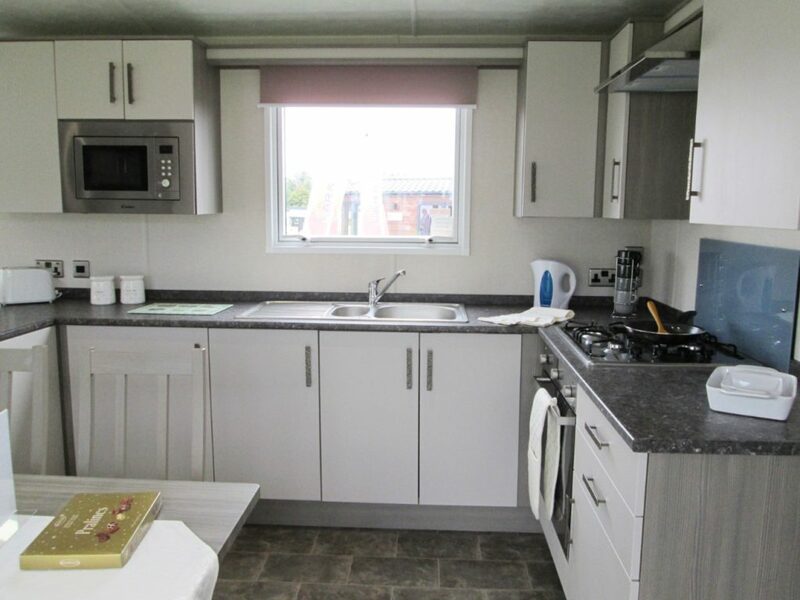 The kitchen on the Millfield is well laid out with a good workflow and we were pleased to see so much storage space – something that’s sometimes lacking on holiday caravans in this price bracket. A short corridor off the kitchen takes us into the bedrooms and bathroom. On the right is the main shower room which has a good-sized shower cubicle with thermostatically controlled shower mounted on the wall and storage corner shelves. 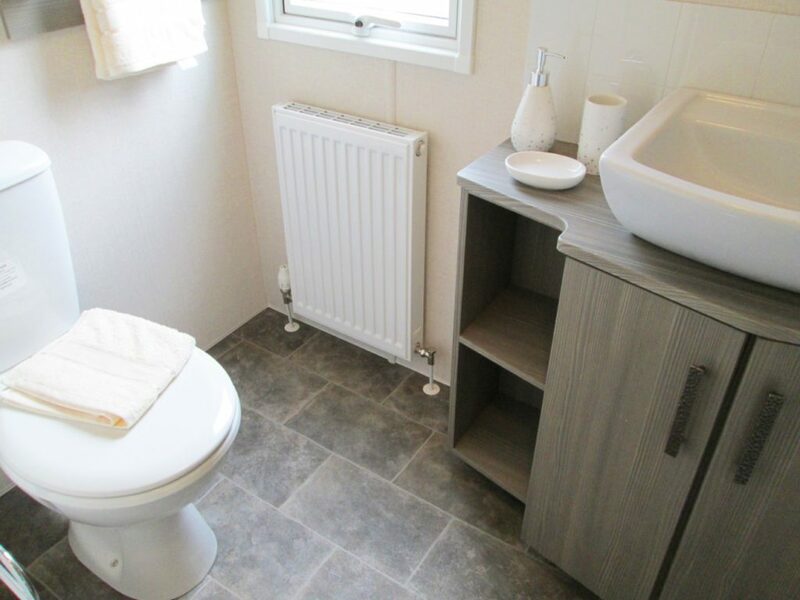 A close coupled button flush toilet and a designer ceramic hand basin sitting atop a cabinet with shelves are also fitted. The floor is covered in a washable vinyl in a brown tile effect. There’s a radiator under the window as well as towel rail and an extractor fan. 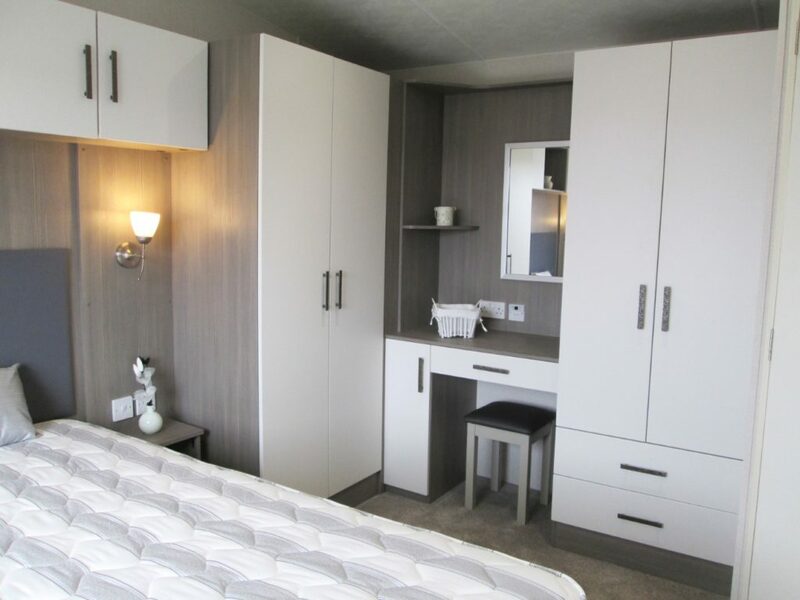 The twin bedroom, although fairly small, manages to fit in a couple of decent sized beds as well as a double wardrobe, vanity shelf with mirror and a set of corner shelves. 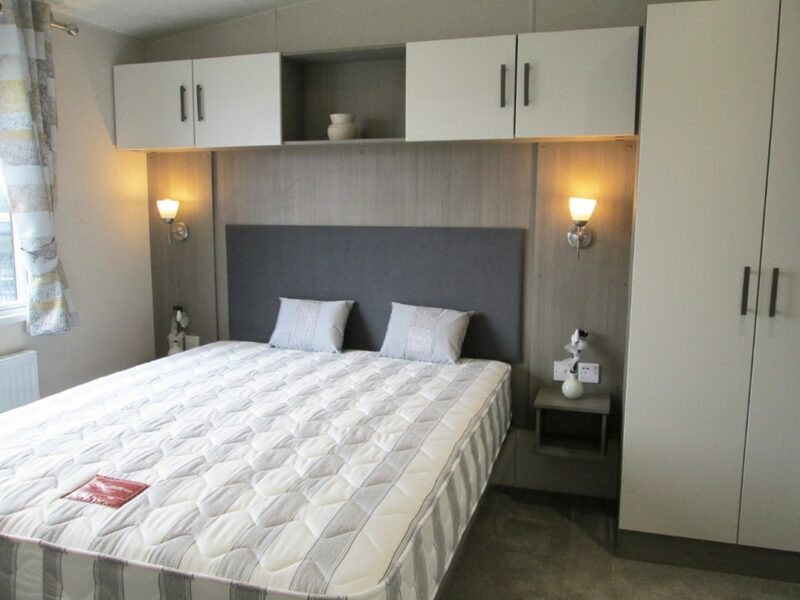 There’s room to walk between the beds which have tall, individual padded headboards, a central reading light and, higher up on the wall, open shelving and a central cabinet. The mattresses look substantial and are SoCozeee types. You can opt to have a space saver fold-under bed to the spare room if space really becomes tight. The main double bedroom is also fairly spacious with the bed offset to one side. Again, there’s a large padded headboard, two bedside tables and two wall mounted reading lamps. Above is a unit with central open shelves and two storage cabinets. 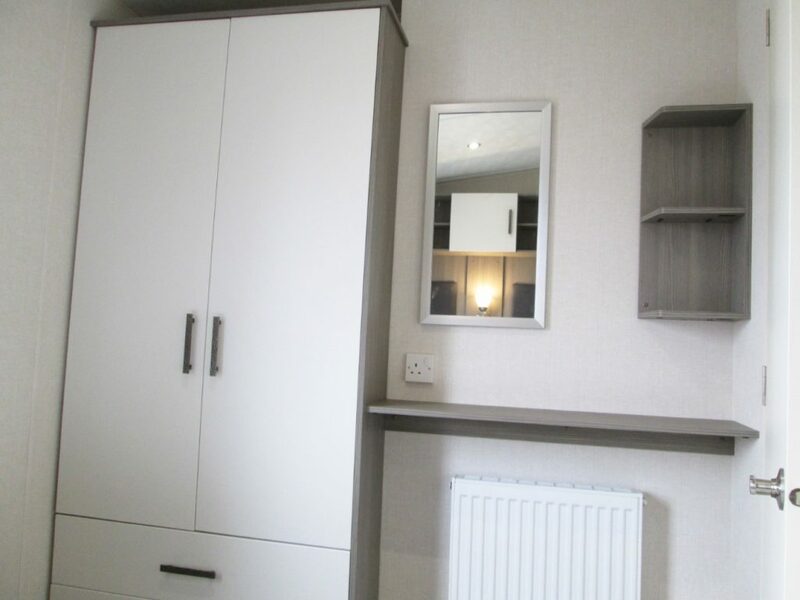 To the right of the bed is a large double wardrobe with hanging space, a vanity dressing area with stool, drawer and cabinet, along with a mirror and to the right again another large double wardrobe with drawers. 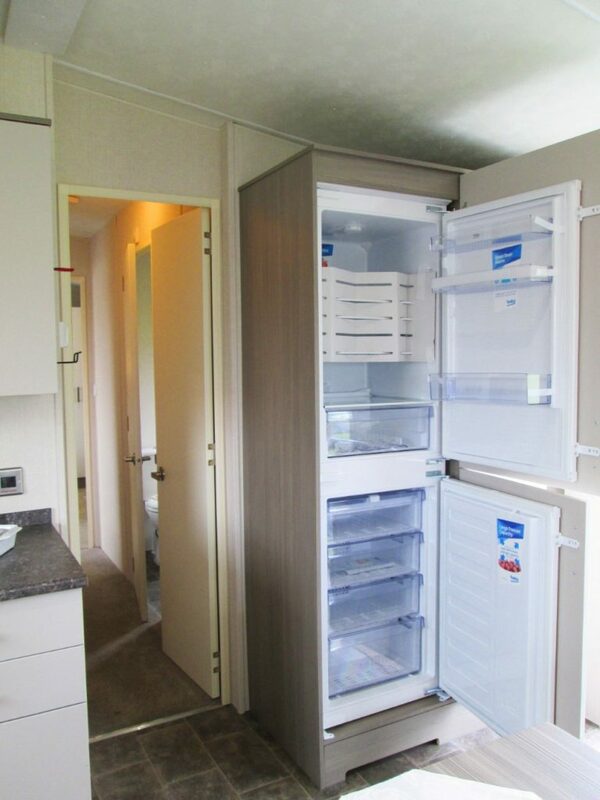 There really is plenty of storage space in this holiday caravan! 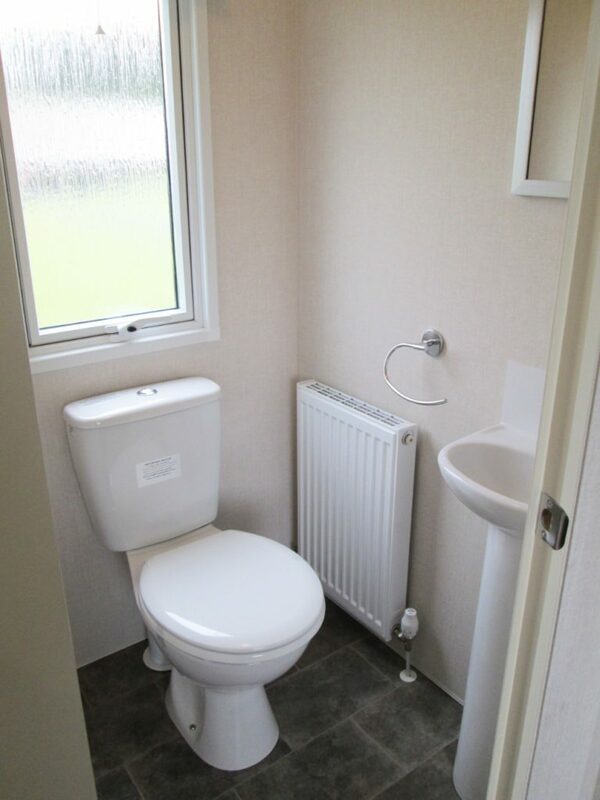 A door in the corner leads into a tiny en-suite with just enough room for a toilet and pedestal hand basin. The room also has a mirror, radiator and towel holder – what more do you need in an en-suite? 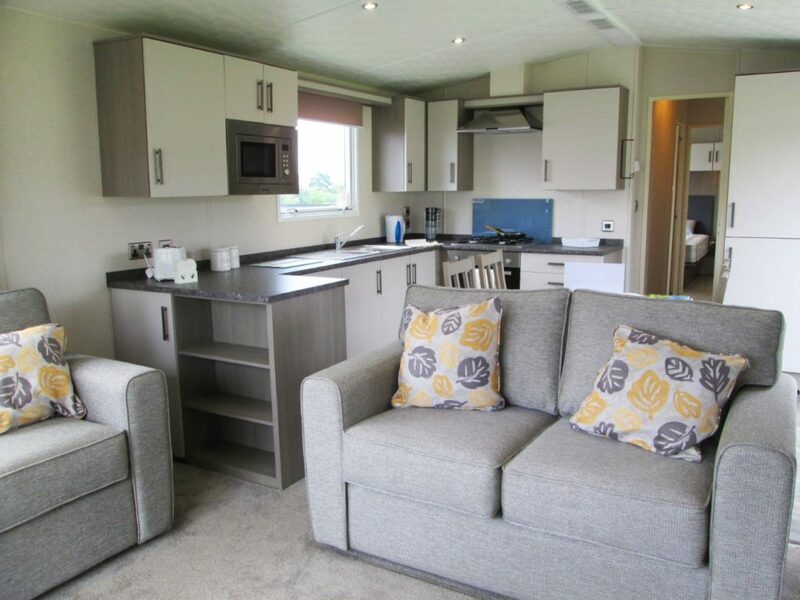 Victory has a deserved reputation for building quality holiday caravans which have well thought out interiors, good storage options and a keen sense of style – all within a very competitive price band. The Millfield is no exception. Good sized front windows and patio door. Excellent storage in kitchen and bedrooms. 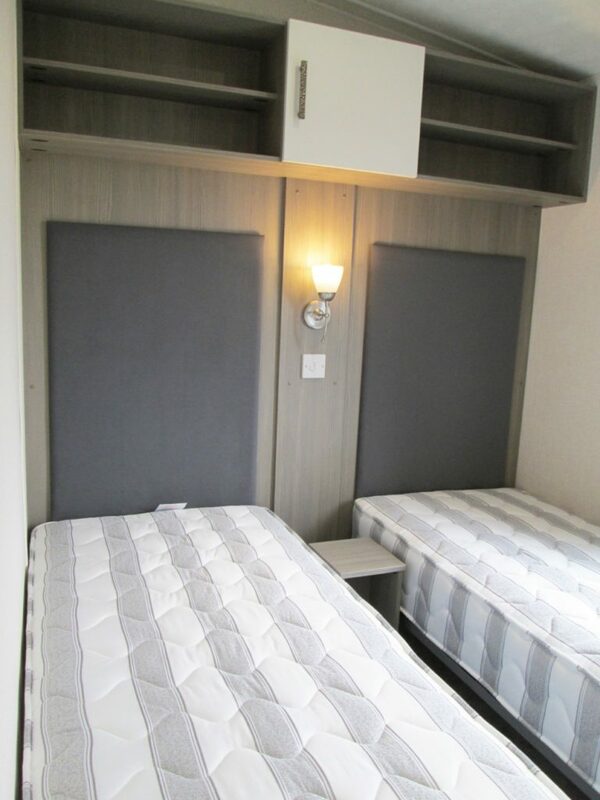 Berths: Four, in two bedrooms (one twin and one double). 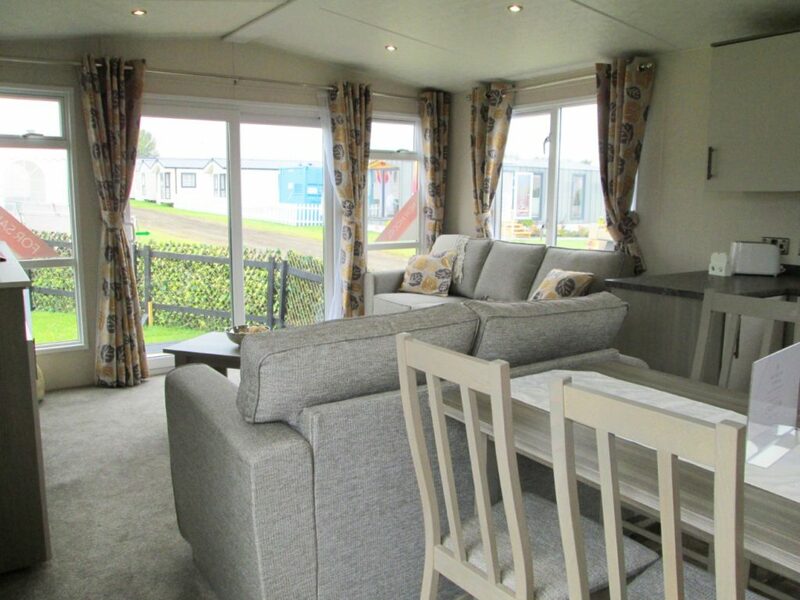 Other layouts available: 39ft x 12ft 6in – three bedrooms. Key optional extras: Anthracite uPVC double glazing with Low-E glass; Combi boiler central heating with room thermostat control; environmental exterior with colour co-ordinated uPVC windows and doors; fully galvanised Fusion chassis; choice of external claddings in various colours; integrated dishwasher or washing machine; integrated fridge/freezer; integrated microwave.